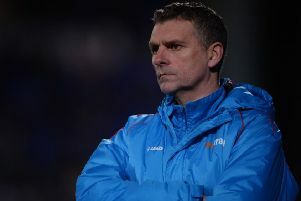 Keith Curle says the Cobblers will have to produce a performance of ‘controlled aggression’ and ‘focus’ if they are to get any reward from their trip to Sky Bet League Two leaders Lincoln City on Saturday (ko 3pm). The Town boss was delighted with the fighting spirit of the his players in Tuesday’s 2-1 win at Tranmere Rovers, and is demanding more of the same at Sincil Bank. The Cobblers travel to Lincolnshire on a high following their success at Prenton Park, and Curle believes his team are capable of upsetting the title favourites if they can reproduce their midweek desire. “We went there on Tuesday, and we said to the players that they needed to match the fighting spirit of Tranmere, because they have got that and it can quite an intimidating place to play,” said the Town boss. “The players accepted that challenge and stood up to it. Curle is an admirer of the Imps, and is well aware that the atmosphere at Sincil Bank can also be an intimidating one, with the Cobblers having already played there this season, losing 3-2 in the FA Cup first round in November. A sell-out crowd of 9,000 is expected this weekend, and the Town boss says his players have to stand up to any attempted intimidation and then stamp their own authority on proceedings. “Lincoln play with a high tempo, they try and intimidate the fourth official on the sideline and the referee to try and get their supporters behind them, and that is how they operate,” said Curle. “It works for them, and what we have to do is make sure our focus is on the pitch, make sure we don’t get intimidated, and manage the game. “Ultimately, we think we can cause them problems with the football, so we need to earn the right to play our football. Although Curle feels Sincil Banl can be intimidating, it is a ground he enjoys taking his teams to, despite the ‘pantomime’ created by the Imps’ coaching staff on the sidelines. “I have been to Lincoln a few times and I enjoy going there, because I enjoy the atmosphere,” said the Town manager. “They get the crowd whooped up and then there are the antics of the management team on the sidelines. “There are probably a lot of people inside the game who don’t like those antics, and I know they have the first team coach sat in the stands telling them when to go up and speak to the fourth official. “But it doesn’t faze me, it doesn’t distract me, and it’s not a focus for me. “That is how they manage, and it is down to them, although I think they have tempered down a little bit. “I think people have made them aware that sometimes, in that do you really want the focus on the pantomime that goes on in the technical area, or on the way your team is performing? The Cobblers will head to Lincoln without the injured trio of Marvin Sordell (knee), Sam Foley (back) and George Cox (ankle), but the rest of the squad is expected to be fit and available.